Fancy colored diamond rings shot into prominence recently when actor Ben Affleck presented his sweetheart J Lo with a rose-colored diamond engagement ring. It is reported to have set him back by a million dollars. Fancy colored diamond rings are much in demand thanks to celebrities flaunting their possessions of these rare gems. Fancy colored diamond rings are very expensive as they are rare and are more sought after than the clear, colorless diamonds. Fancy colored diamond rings are more difficult to track down and are found in few jewelry shops around the world. 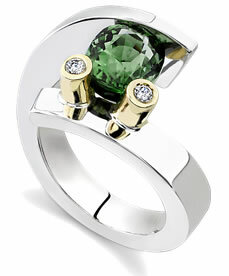 They can be found in specialist jewelry shops that stock rings to suit all kinds of budgets. The fancy colored engagement rings you select need not be as costly as J Lo’s ring. When buying fancy colored diamond rings, it is important to remember that the diamonds of a single color, say pink, may be available in different hues. Some hues are more popular than others and if you select a less popular hue you may save a lot of money. Ask the jeweler for tips – and if the exact shade you want is more than your budget then the jewelers themselves may suggest an alternative color or shade. Since fancy colored diamond rings are rare, jewelers may find it difficult to obtain the exact specific hue you want. It is easier to find your exact shade by finding some jewelers who specialize in fancy colored diamond rings. These jewelers will offer a better choice at a better price. Not only will you be able to acquire the exact color you want, you will also be able to get the job done quickly since they are specialists in this field. Novori Jewelry can assist you with you purchase of a fancy colored diamond, just give us a call toll free at 1-877-877-4141. The growing demand for rare, fancy colored diamond rings has led jewelers to resort to other techniques to increase their supply. Some jewelers have developed chemical treatments to artificially induce certain desirable hues and shades to a diamond. At Novori Jewelry we never sell treated or enhanced diamonds. Before purchasing a gemstone, ask if it has been treated or not. These artificially created fancy colored diamond rings are less expensive than the naturally occurring shaded diamonds but more expensive than the uncolored stone. So, if you want to buy a fancy colored engagement ring that is beyond your budget then there is hope. Artificially treated stones are almost as good as the natural ones. Only experts can differentiate them by close inspection. Save a few dollars a month in your bank and while the pennies pile up into fat dollars, do your homework – ask around for specialist ring jewelers who can provide you good quality diamonds at affordable prices. It is always advisable to buy the diamonds from a reliable, verified supplier. If you pinch pennies then you may think you have saved money; however, in the long run you will soon realize that you have been cheated – perhaps may have paid the price of a natural colored stone in exchange for an artificially colored one. So, stop dreaming about a fancy colored diamond ring and research your options. Gift a fancy colored diamond ring to your special love and get set for a colorful beginning to your new life. Novori Jewelry specializes in diamond engagement rings and natural, certified diamonds. We would be pleased to assist you with your diamond jewelry purchase.